These two articles were originally published in the May 29, 1911 Indianapolis Sun. 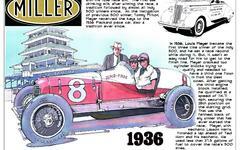 The best is a report on the events at the Indianapolis Motor Speedway the day before the Indianapolis 500 when Bob Burman set several records. An interesting point that I had not come across before is that his Blitzen Benz may have caught fire - and the flames were extinguished with dirt from flower pots! On this count I am a tad incredulous because it goes further to say that the car was pushed back to the garage for repairs in the event that it might be needed in the race. The problem being the car was ineligible for the race due to its excessive engine size. Another point I want to underscore is that the article reports that the first Indianapolis 500 was not a stock car event. The explanation is that it was a class "E" event, for cars of less than 600 ci, but special-purpose built for auto racing. Also, drivers that failed to qualify are listed, including a R. Jenkins, whom I believe to be Australian Rupert Jenkins, Ralph De Palma's riding mechanic from the 1912 Indianapolis 500. The other articles talks about the memorial services throughout the city to celebrate fallen war heros. In this vein, it is mentioned that numerous church leaders felt it was outrageous to stage such huge sporting contest on a day of remembrance.